Another great turnout for the Foundation’s 4th Annual Bird City Match Day event with a total of $36,750.96 being raised for our local organizations and community projects. 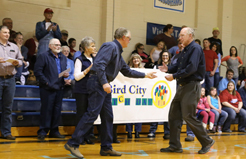 This annual event has put more than $164,000 back into the Bird City and Cheylin communities since it first started in 2013. The beginning of 2015 brought new opportunities for Bird City Century II Development Foundation’s first Executive Director, Cathy Domsch. It was a bitter-sweet moment as Cathy’s years at the Foundation came to an end in March, as new doors opened for her in her hometown, Atwood, with the opportunity to work for the fast-growing & successful business, SureFire Ag. This all fell in good timing as she will have more time to spend with her family, as well as follow her daughter’s sports and school events as she enters Junior High this Fall. Cathy started working for the Foundation in 2005 and was very involved and focused on building the Bird City / Cheylin community. In Cathy’s 10+ years here, the Foundation assisted with the renovation of the city park, recruit Bird City Dairy and other small businesses, open Heartland Child Care which then closed and funding transitioned to start a Cheylin Preschool Program, construct the Cheylin Wellness Center, 5th Street Apartments and Senior Estates, and renovate the Security State Bank building, American Legion and City Hall. The Cheylin Entrepreneurship Fair, summer entrepreneurship camps, and the Business Incubator Program were all started through the Foundation, which have and will continue to be resources to educate students and assist entrepreneurs in Bird City. The community has seen great opportunities arise and successful projects completed in her years at the Foundation, and although her dedication and commitment will be missed, she has made a big impact in the community that will be remembered!! With Cathy’s resignation, Darci (Nelsen) Schields, who has worked as the Foundation’s Administrative Assistant since 2008, has transitioned her responsibilities into Foundation Director, focusing on sustaining the good works that have been built up over the years, and continuing forward with projects and goals that will have a positive impact on the community. This year’s summer intern, Elizabeth Keltz, an upcoming senior at Cheylin, will be helping in the office, as well as implementing the children’s “Color the Town” activity leading up to 4th of July festivities, and the Youth Entrepreneurship (E-) Camps (1st-4th & 5th-8th grades). Contact the office (734-2556) or watch newspaper / flyers for more information! What is Bird City Match Day?? The annual event was started in 2013 in conjunction with national “Giving Tuesday”; a global day dedicated to helping others and giving back. The Bird City Century II Development Foundation board has pledged specific amounts each year that is set aside as ‘match money’ for this one-day event. Eligible organizations and projects within the Bird City / Cheylin community that benefit from the event are determined in advance (eligible entities must be a non-profit 501(c)(3) organization, or have an educational, religious or government tax status). During the Match Day event, individuals and businesses are invited to make their charitable contributions at the Bird City Century II office where the donor designates the dollar amount and organization(s) and/or project(s) they wish to financially support that day. At the end of the event, total incoming donations are calculated for each organization; the Foundation’s match is then figured on a pro-rated percentage basis and applied accordingly. Grant checks are then presented to each of those organizations. This event has been very successful in helping to promote and financially assist our local non-profits; giving some additional financial resources to help implement programs and projects within their own organizations as well as carrying out projects within the community. Bird City Century II Development Foundation matched $12,432 in 2013 (a $1 to $1 match); the Foundation upped their matching funds to $15,000 in 2014 (which came out to almost a .70 to $1 match); and in 2015 the Foundation doubled their pledged match with $30,000 (approximately .90 to $1 match). The number of donors that participated during our 2015 Bird City Match Day event more than doubled in number from 2013; great support that goes right back into the community! This past December, between incoming donations and the Foundation’s match, a total of $64,365 was raised; benefiting 27 different organizations and/or projects. 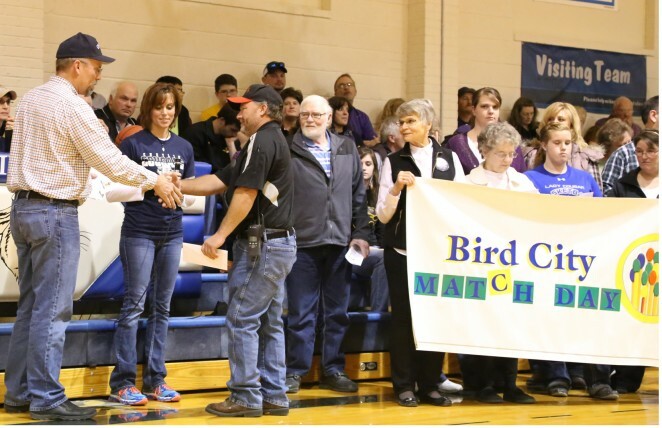 Since 2013, a total of $127,354.31 has benefited the Cheylin community through this annual Bird City Match Day event!! The Bird City Match Day event held on December 2, 2014, was a very successful giving event, hosted by Bird City Century II Development Foundation (BCCII) the past two years. The spirit of giving was apparent as more than 50 donors stopped by BCCII office that day, donating to various organization(s). This year, the incoming contributions at the end of the day totaled $22,773.44. The Foundation’s match of $15,000 (which was pro-rated and matched at approximately .70 to every dollar), along with six $25 door prize drawings (winners designated the $25 to the organization of their choice); brought the day’s grand total going back into the Bird City/Cheylin community to $37,923.44!! A total of 26 local organizations/programs received grant checks; a great event for a community of our size!! There were 22 on the list that were eligible for the match; however, other (non-matched) donations were also accepted that day. 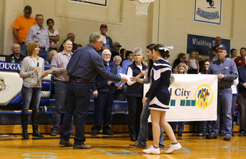 Grant checks were presented to representatives for each recipient at Cheylin’s home basketball game Friday, January 16th. The First Annual “Bird City Match Day” was held on December 11th, a ‘giving event’ sponsored on behalf on Bird City Century II Development Foundation to raise awareness of, and funds for, our local non-profit organizations. 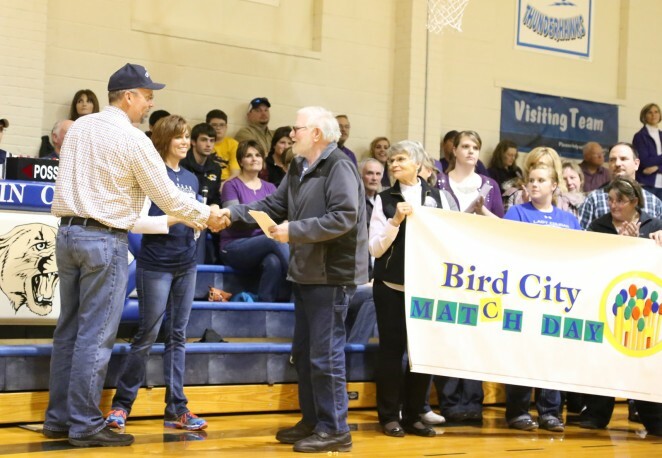 Bird City Match Day raised a grand total of $25,065.86 through cash, checks and grain contributions, which was then presented to a total of 21 non-profits in the Bird City/Cheylin communities. Originally, Bird City Century II had agreed to MATCH the first $10,000 in contributions that were made from the community that day, but due to some leftover funds in the Foundation’s grant-making budget, the Board of Directors decided to match $12,432.93 (the full amount from the community to eligible organizations).